If you were expecting any obscenities in today's "Sleep Quickie", you will probably be disappointed to hear that this article is solely about sleep, metabolism and melatonin and how all that relates to "shutting your eyes and disappearing into the land of dreams". This means that it won't touch on the 19% increase in copulatory efficiency and the other "significantly facilitated" aspects of sexual activity (mounting latency -80%, ejaculatory latency -63%, etc.) scientists from the University of British Columbia observed in melatonin treated (4 mg/L of drinking water) Long-Evans rats (Brotto. 2002). Profound effects of sleep restriction on the human plasma metabolome (Bell. 2014) -- In spite of the the fact that it is well established that short sleep durations and/or poor sleep quality induce changes in our energy and substrate metabolism (Penev. 2012) that increase your risk of developing diabesity (Cappuccio. 2010), we know very little about the biochemical signatures involved in the pathogenesis of type 2 diabetes[5–9]. Looks pretty bad, right? That's just what I said. Bell et al. did thus decide to use a metabolomic profiling approach to assess the impact of recurrent sleep restriction on human intermediary metabolism to identify biochemical signatures that may reflect the effects of sleep curtailment on metabolic risk. To this ends, each study participant completed two 8-night inpatient sessions with restricted (5.5-h time-in-bed) vs. adequate (8.5-h time-in-bed) sleep opportunity while daily food intake and physical activity were carefully controlled. The subsequent combination analysis of 362 biochemicals in fasting plasma samples that were collected from study participants the morning after each 8-night sleep treatment revealed that..
the circulating levels of glucose, some monosaccharides, gluconate, andfive-carbon sugar alcohols tended to decline when sleep was reduced. According to the researchers the elevation in plasma amino acids (~6-70%), specifically isoleucine, tryptophan, phenyllactate, a byproduct of the phenylalanine metabalism, glutaroyl carnitine, byproduct of the lysine metabolism, histidine and threonine. If these changes are corollary or causally involved in the increased diabesity risk we see in sleep deprived indiviudals is yet something the researchers cannot tell us, yet. Incidentally, the same is true for the answer to the question whether similar changes would have been observed if the hitherto healthy, lean subjects didn't have a parenteral history of type 2 diabetes. The Bell study must therefore be seen as a first in a series of studies that could broaden our insights into the role of abnormal sleeping patterns in the etiology of type II diabetes and other metabolic disease. 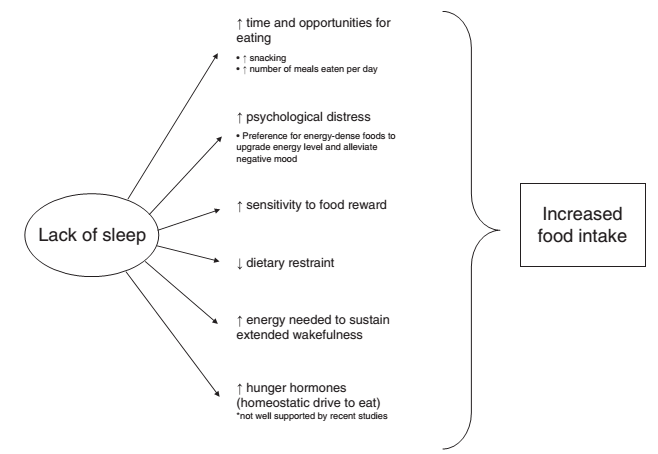 Food ↻ sleep interactions and their potential role in the etiology of diabesity (Chaput. 2013) -- The insights we may gain from the previously discussed study by Bell et al. may give some indication of whether or not the increase in energy intake that's so characteristic for sleep deprived human beings is a crucial, necessary or conditional contributer to the increased diabetes and obesity (=diabesity) risk in this population. In his recent paper in Physiology & Behavior Jean-Philippe Chaput aptly illustrated the six pillars on which this increase in energy intake is based (see Figure 1). Chaput does yet also point out that the ingestion of certain foods / food types, especially those which impact the availability of tryptophan could ameliorate these effects that are mediated by their beneficial effects on (Peuhkuri. 2012) and cites examples such as cow's milk that has has traditionally been considered a tranquilizing beverage with sleep-inducing capacity in many Western countries (an effect that could not be confirmed in scientific studies, cf. Valtonen. 2005; Yamamura. 2007). tea) and certain fruits (e.g. tart cherries or kiwifruits), but again, robust scientific evidence supporting this is, in many cases, nonexistent (Pehkuri. 2012). And with respect to tryptophan, which is a precursor to the neurotransmitter serotonin and the neuro-secretory hormone melatonin, have only been confirmed in studies using pharmacological doses way above the maximal amount you could get from food. Can exercise attenuate the metabolic effects of dim light at night? (Fonken. 2013) -- You will be aware that going to bed right after an intense HIIT session is beside the point. Your chances of falling to and gettins some restful sleep don't border zero, they are zero. Against that background it may initially sound surprising that researchers from the Department of Neuroscience at the Ohio State University have recently argued that exercise could exert at least part of its beneficial anti-obesity effects by strengthening and realigning the circadian rhythm. To test this hypothesis Fonken et al. maintained four groups of mice in either dark (LD) or dim (dLAN) nights and provided them with either a functional or a locked running wheel or a locked wheel. As it turned out, "[m]ice exposed to dim, rather than dark, nights increased weight gain." If the mice had access to a functional running wheel, however, the dim light at night hat no effect on their body mass. This sounds fantastic. Unfortunately, the effect was not brought about by a preventive effect exercise may have on the dim-light-induced defect of the animals circadian system. It was brought about by an increase in energy consumption by the means of which the rodents compensated for the increases in daytime food intake. Melatonin supplements work and won't lose efficacy over time (Ferracioli-Oda. 2013) -- In view of the fact that the classics, i.e. milk and camomile tea obviously don't do much to improve your sleep quality (see previous paragraph), it's all the more important to emphasize that Eduardo Ferracioli-Oda, Ahmad Qawasmi, and Michael H. Bloch's meta-regression analysis that examined the influence of dose and duration of melatonin on reported efficacy yielded results all the melatonin lovers out there will certainly appreciate. 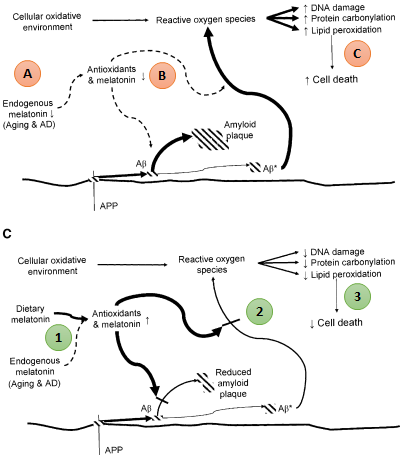 Figure 2: Restoring reduced melatonin levels (A,B,C) to youthful levels by supplementation (1-3) counters the build-up of ameloid plaque (➲Alzheimer's; cf. Lahiri. 2004). In that, it's quite amazing that the efficiency increases in a both dose- and time-dependent manner. In other words, the ability of melatonin to decrease sleep latency and increase your total sleep time increases the more you take and the longer you stay on a supplementation regimen that mimics the natural diurnal melatonin rhythm. 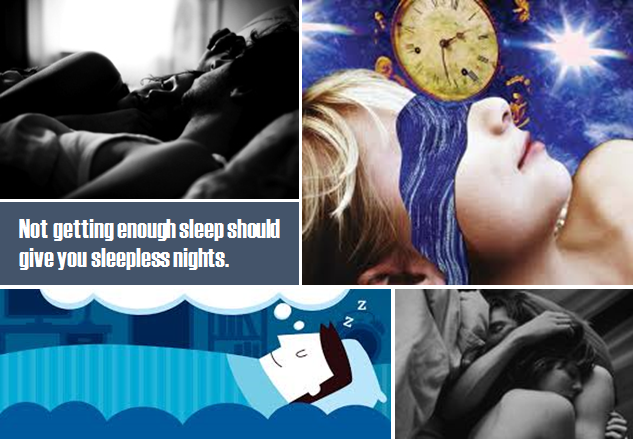 Bottom line: You better make sure you get enough quality sleep, if you don't want to jeopardize your health. If you manage to go to bed "early" every day you will see that after 1-2 weeks you won't even need an alarm clock to get up on 6am, when you went to bed shortly before 10pm the night before... well, assuming that you didn't work out at past 6pm, didn't expose yourself to bright or even worse bright blue light from laptop, iPad or LED TV past 8pm and use ear-plugs to block out all shatter, noise or whatever may wake you up when before 6pm. If all these tips don't help you sleep and/ or you have 5 or 6 decades of extra years under your belt, it may be worth investing in a bottle of 3-10mg melatonin capsules. Avoid the slow-release preparations (unless you like being drowsy the next morning) and take them 1h before you go to bed. Bell, Lauren N., et al. "Effects of sleep restriction on the human plasma metabolome." Physiology & behavior 122 (2013): 25-31. Brotto, Lori A., and Boris B. Gorzalka. "Melatonin enhances sexual behavior in the male rat." Physiology & behavior 68.4 (2000): 483-486. Bubenik, G. A., and S. J. Konturek. 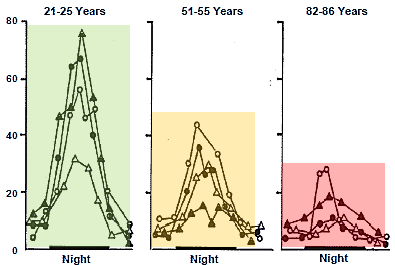 "Melatonin and aging: prospects for human treatment." 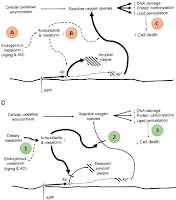 Journal of Physiology and Pharmacology 62.1 (2011): 13. Cappuccio, Francesco P., et al. "Quantity and Quality of Sleep and Incidence of Type 2 Diabetes A systematic review and meta-analysis." Diabetes Care 33.2 (2010): 414-420. Cappuccio, Francesco P., et al. "Sleep duration and all-cause mortality: a systematic review and meta-analysis of prospective studies." Sleep 33.5 (2010): 585. Cappuccio, Francesco P., et al. "Sleep duration predicts cardiovascular outcomes: a systematic review and meta-analysis of prospective studies." European Heart Journal 32.12 (2011): 1484-1492. Fonken, Laura K., et al. "Exercise attenuates the metabolic effects of dim light at night." Physiology & behavior 124 (2014): 33-36. Lahiri, Debomoy K., et al. "Dietary supplementation with melatonin reduces levels of amyloid beta‐peptides in the murine cerebral cortex." Journal of pineal research 36.4 (2004): 224-231. Lin, Li, et al. "Melatonin in Alzheimer’s Disease." International journal of molecular sciences 14.7 (2013): 14575-14593. Peuhkuri, Katri, Nora Sihvola, and Riitta Korpela. "Diet promotes sleep duration and quality." Nutrition Research 32.5 (2012): 309-319. Penev, P. D. "Update on energy homeostasis and insufficient sleep." Journal of Clinical Endocrinology & Metabolism 97.6 (2012): 1792-1801. Srinivasan, Venkatramanujan, et al. "Melatonin agonists in primary insomnia and depression-associated insomnia: Are they superior to sedative-hypnotics?." Progress in Neuro-Psychopharmacology and Biological Psychiatry 35.4 (2011): 913-923. Valtonen, M., et al. "Effect of melatonin-rich night-time milk on sleep and activity in elderly institutionalized subjects." Nordic Journal of Psychiatry 59.3 (2005): 217-221. Yamamura, S., et al. "The effect of Lactobacillus helveticus fermented milk on sleep and health perception in elderly subjects." European journal of clinical nutrition 63.1 (2007): 100-105.